Home › News Updates › Lower Returns From EPF This Year? Lower Returns From EPF This Year? Malaysians looking forward to higher dividend payouts by the Employees Provident Fund (EPF) this year would likely be disappointed as global and domestic markets continue to be roiled by uncertainties and volatility. In a statement released early last week, EPF’s chief executive officer Datuk Shahril Ridza Ridzuan revealed that the pension fund with assets under management of some RM680 billion has got off to a rough start and was bracing itself for a challenging year ahead. “The uncertainties in the world economy, following prolonged slower growth in major economies and high volatility in the equity markets and commodity prices, are expected to remain throughout the year,” he said in the statement. Global markets was off to a bad start this year, resulting in most funds seeing a drop in their returns. 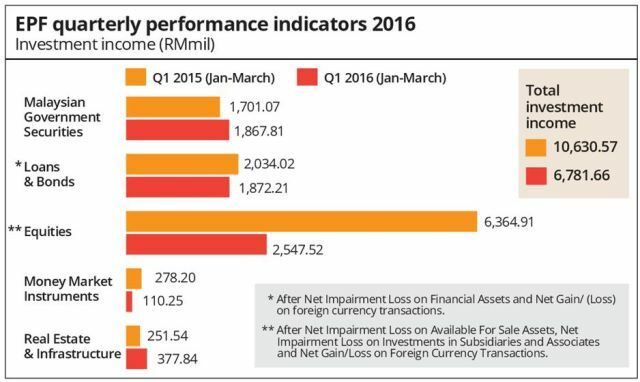 EPF’s first quarter (Q1), which ended March 31, 2016 saw a 36.2% decline year-on-year in investment income to RM6.78 billion from RM10.63 billion in the same period in 2015. “The first quarter of this year had almost all global equity markets, including the FTSE Bursa Malaysia KL Composite Index, recording declines, leading to lower income contribution from our total equity portfolio,” Shahril said. “Accordingly, the contribution of global assets to total income decreased to about 22% compared with 47% last year due to lower capital and foreign-exchange gains,” he added. The EPF had earlier announced that it was gradually increasing its investments in equities in order to maintain its growth momentum, as yields from the fixed income division slow down. However, in Q1 2016, equities – which made up 41.43% of the EPF’s total investment asset –contributed just RM2.55 billion or 37.56% of the total income. This was 59.98% lower compared to the RM6.36 billion recorded in the same period in 2015. Income deriving from dividend payouts is also expected to take a hit as the drop in share prices globally and domestically has led to fewer opportunities for the EPF to realise trading income during Q1 2016. Meanwhile, as of end-March 2016, fixed income instruments, representing 51.72% of the EPF’s total investment size, emerged as the main contributor of income for Q1 this year. The asset class contributed a total of RM3.74 billion of investment income or 55.15% of the quarterly income. Malaysian Government Securities generated RM1.87 billion in income during the quarter under review, up 9.8% or RM166.7 4 million, compared with RM1.7 billion in Q1 2015. Loans and bonds also recorded a dip in investment income, raking in a total of RM1.87 billion in Q1 2016 compared to RM2.03 billion in the same period last year. 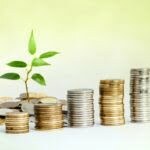 Finally, the pension fund’s investment in money market instrument, which currently stands at RM22.58 billion, contributed RM110.25 million of income, while Real Estate and Infrastructure, accounting for 3.54% of total investment asset, yielded a total income of RM377.84 million in the first quarter. This was followed by income received from rentals and income recognised by its associate companies. The EPF boosted its annual dividend payout last year to 6.4%, or a total payout of RM38.24billion. Last year, the total number of members increased to 14.5 million, out of which 6.7 million were active members. Total number of employers contributing to the EPF has increased to 536,489, The Star reported.